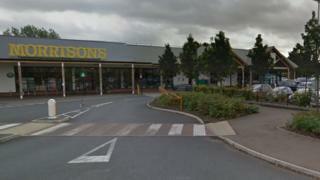 A man accused of murder after a fatal fight in a supermarket told police it was "self-defence", a court was told. Nick Rogers, 26, from Wymondham suffered a fatal cardiac arrest after being punched and kicked in the head by two men at the town's Morrisons store on July 17. John Monk, 44, and his nephew Lee Monk, 20, both from Wymondham, deny murder and actual bodily harm. Lee Monk told jurors at Norwich Crown Court he was "scared" and "panicked". Mr Rogers had been a close family friend before a year-long feud developed over an alleged stolen item of jewellery, Lee Monk said. He told the court he was shopping with his girlfriend when he locked eyes with Mr Rogers, who was with another man, Leo Wardrop. "I was pretty scared", he said, as they approached him, with Mr Rogers using threatening language. Mr Monk said he repeatedly told the older, bigger man that he did not want any trouble. "I panicked and threw the first punch which didn't connect," the court heard. He became aware his uncle had appeared and had his hands on Mr Rogers. Lee Monk told jurors he threw several more punches and one hit Mr Rogers, who fell to the floor. He said he kicked him while he was on the floor to keep him down so he could get away, aiming for his chest but hitting the side of his neck instead. Asked if he intended to kill Mr Rogers, Lee Monk replied: "He was my friend at one point. I would never, ever do that." John Monk's police statement was read out to the court in which he answered "no comment" or "watch the CCTV mate" to most questions. He told a detective he had gone into the store to buy orange juice when he heard a commotion. He said he was "100% certain I never hit him" but was "in the wrong place at the wrong time" after stepping in to defend his nephew.